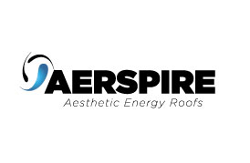 AERspire develops and sells a highly aesthetic building integrated solar energy roofing solution. AER is a highly aesthetic roofing solution that replaces conventional roofing materials and generates electricity. Based on the best module technology, it offers a good kWhr price. AER is a modular concept based on active and passive products all with the same homogeneous appearance. The products are based on the best available module technology which guarantee high and longer performances. With their extensive experience in the solar industry and expertise in the building secor, AERspire is a partner from the early stage of a building project so as to realise the most optimal technical and financial solution for the customer. AERspire is more than a design and product supplier, the venture takes the full responsibility up to installation, commissioning and hand-over. There is a requirement to meet the increasingly stringent energy label requirements for buildings and a demand to do so in an aesthetic way. AER is a modular roofing solution that generates photovoltaic electricity and is integrated in glass panels that fully replace conventional roofing materials and suit every type of tilted roof. The product portfolio contains ‘active’ and ‘passive’ elements that offer a full roof solution with a homogeneous look. Designed to be a building component. Equal life span compared to today’s standard roofing materials. Optimal water retaining surface, no additional materials needed.